This site is located off the junction of Woodhouse Lane and Panfield Road. There are 16, 2 bed three person apartments and 2, 2 bed 4 person apartments being built on this currently unused site. Prior to construction, there is a vacant building to be demolished to allow the access point to the secured parking area for the residents. Through the planning consultation phase the building design has a nod to the previous church that stood on the site. Development Site Woodhouse Lane, Former Church Site. 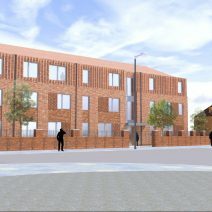 Scheme Details Entered into contract with Rowlinson Constructions Limited to deliver 18 apartments on the former church site of John Fisher and Thomas More.